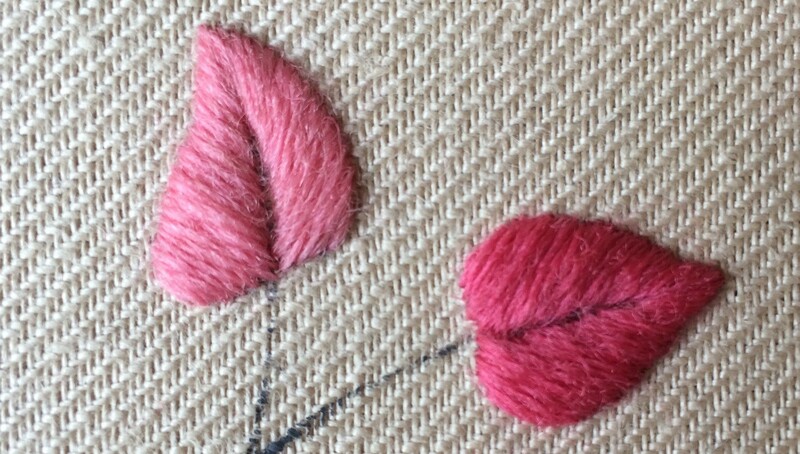 For this tutorial I will be showing you how to work a padded satin stitch leaf, however there are many different varieties of this stitch, such as slanted satin stitch, straight satin stitch, encroaching satin stitch, among others. 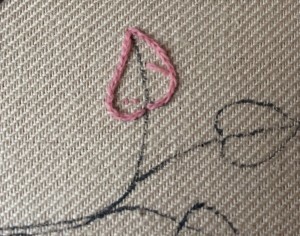 To make sure the satin stitch is neat and keeps a smooth shape, a split stitch should be worked around the outside of the shape you wish to fill, following the design line. 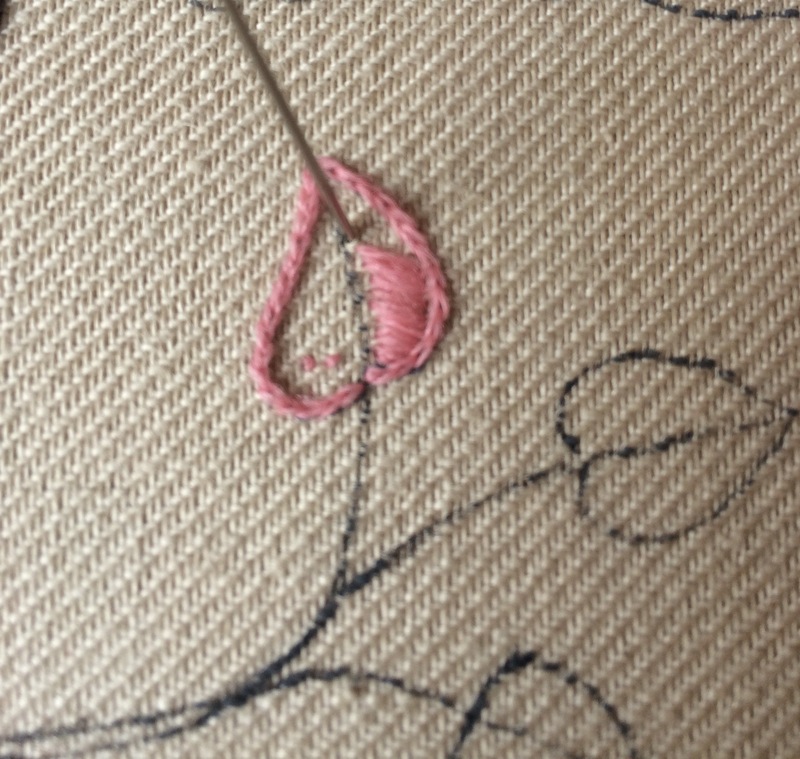 When worked correctly, this gives you a solid base to work your satin stitch over. Begin by bringing your needle up at the start of the line. 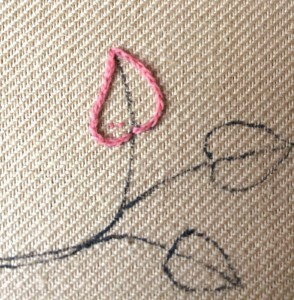 Take a small stitch, about 2-3mm in length along the design line. 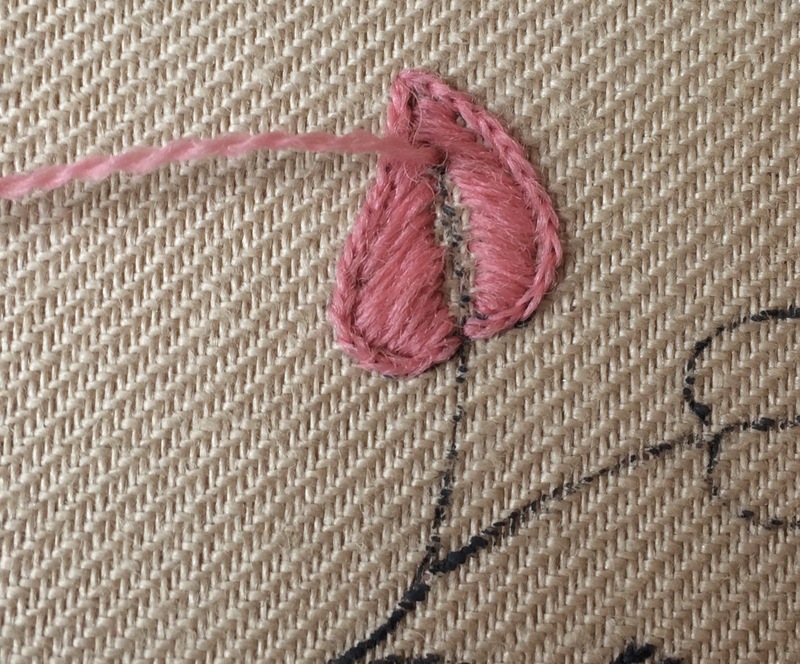 Bring your needle back up through your first stitch. 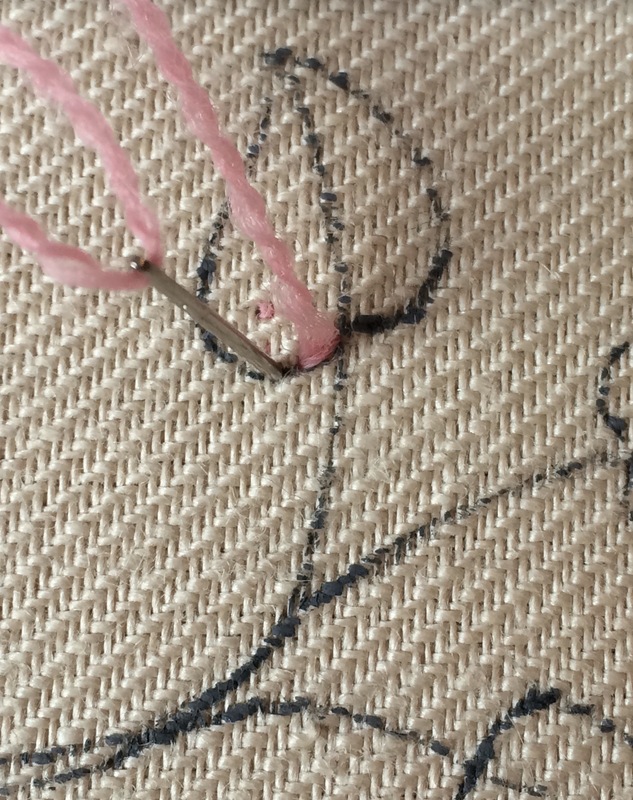 Making sure that you split the stitch in the middle. 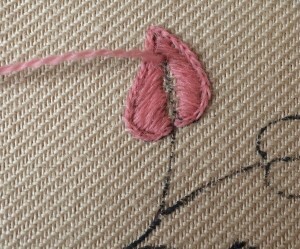 Take another stitch down into the fabric along the design line. 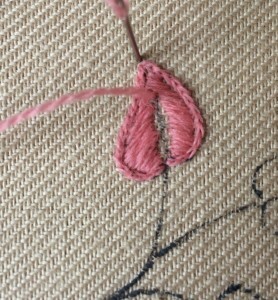 This should be the same length as your first stitch. 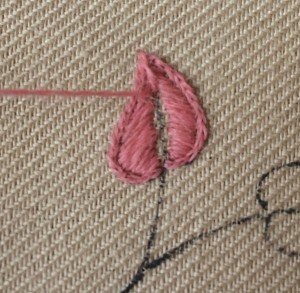 Come up through your second stitch, again splitting the previous stitch in the middle. Continue around the shape following the design line making sure that you stitches are tight, even and smooth. 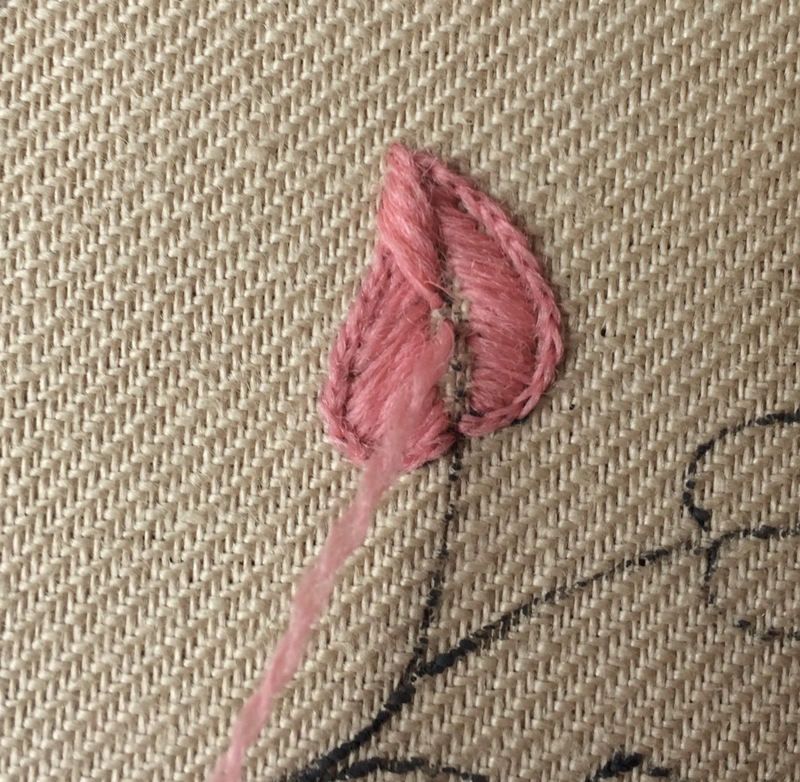 Even though the split stitch will be covered by your satin stitch, it’s still really important to keep it neat to give your satin stitch a good base. 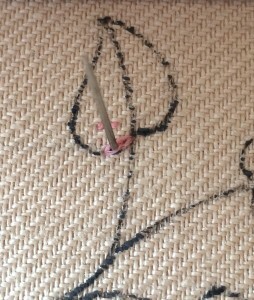 Bring your needle up next to the central vein line, leaving a small gap. The needle should be positioned centrally within the design. 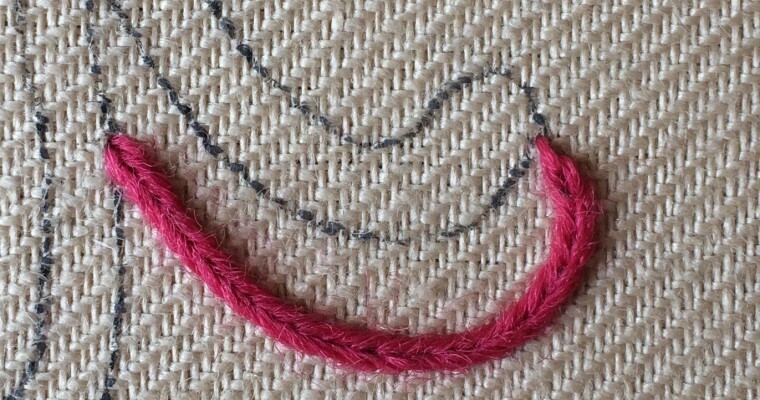 Take a stitch down next to the edge of the split stitch. 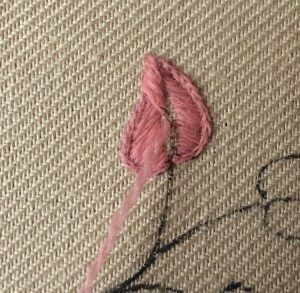 Your stitch should run in the opposite direction you intend to work the satin stitch. 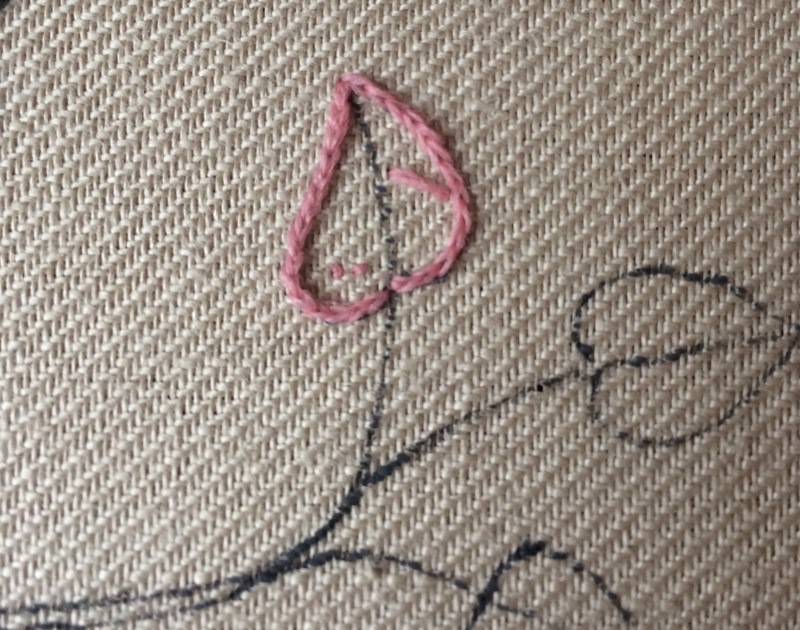 This is so that when the satin stitch sits on top, it doesn’t slip between any padding stitches. Bring your needle up next to where you have just taken the needle down. 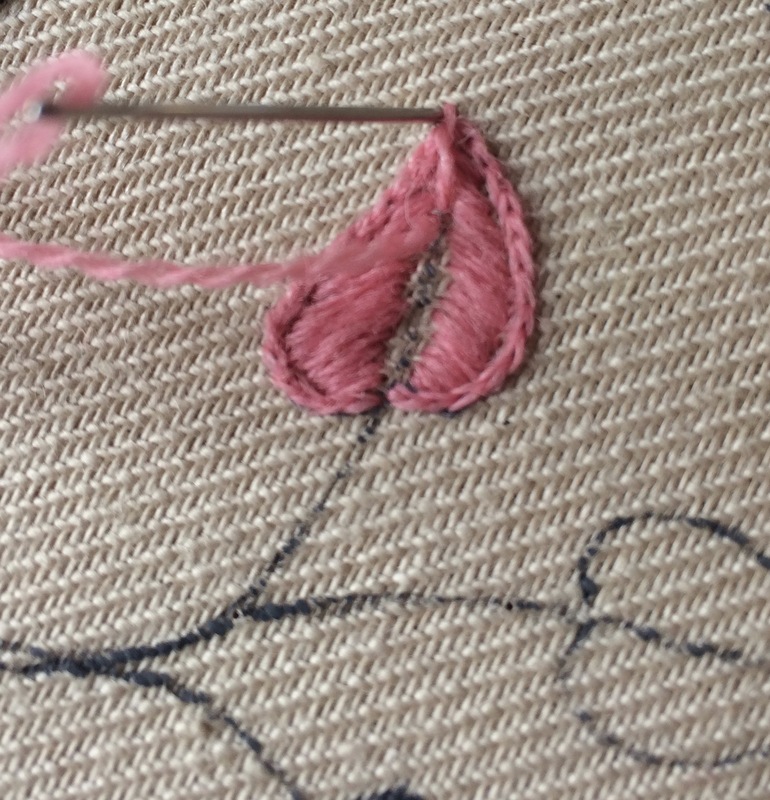 Create a parallel stitch as close to the first stitch without them overlapping. Buy doing this you are reducing the amount of stitching on the back, helping to keep it neat. 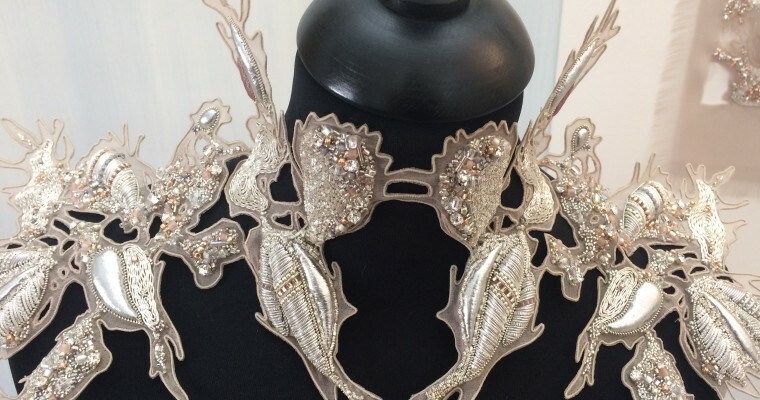 Continue to work in this way to the base of the design. When you have reached the end, repeat the process moving towards the point. You can then fill in the other side in the same way. 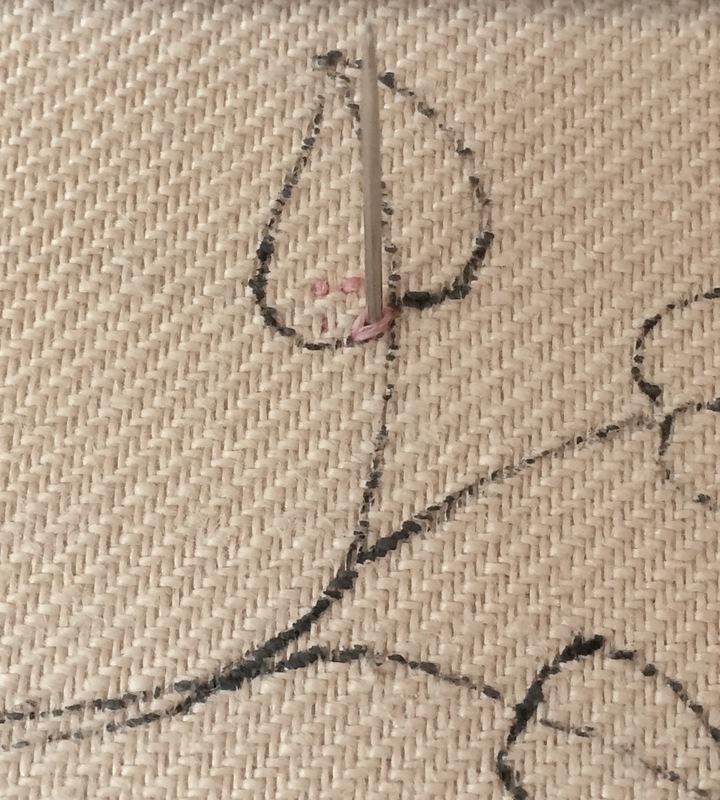 Bring your needle up about 5mm from the point, along the central vein. 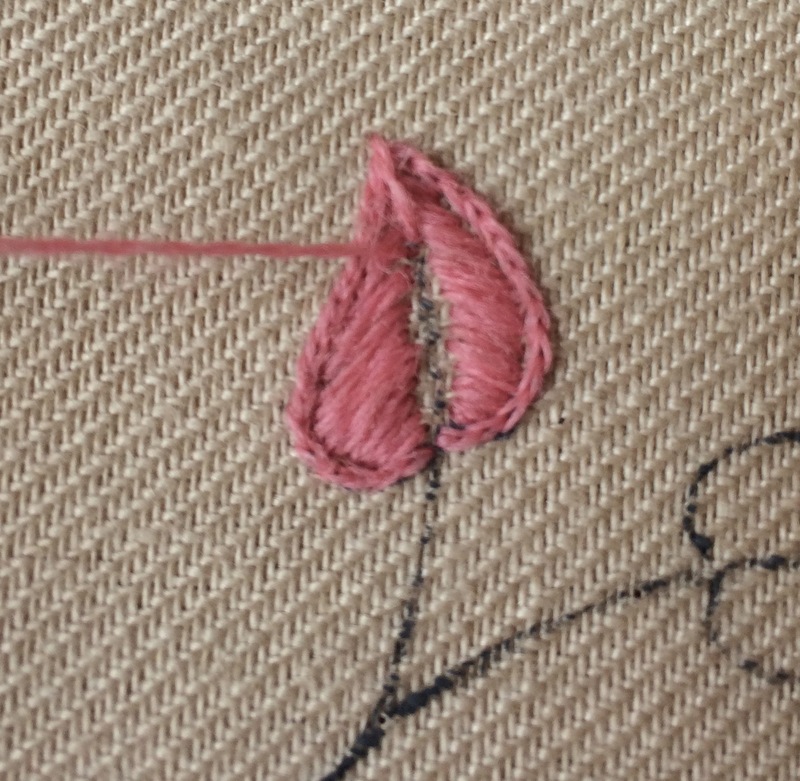 Take a stitch down over the point, so that the split stitch is covered. 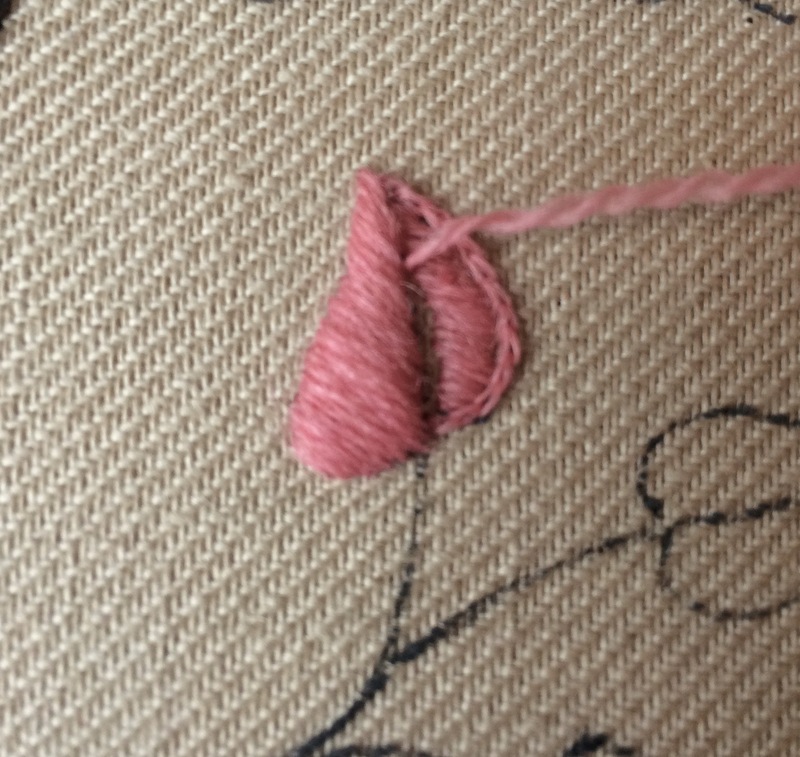 It is important to extend the stitch fractionally beyond the split stitch as this gives you a nice, sharp point. 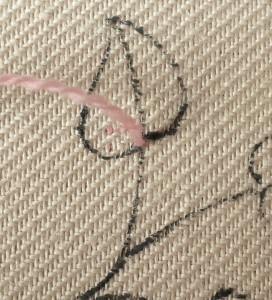 Bring your needle up again on the vein line slightly below your first stitch. 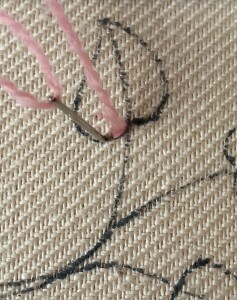 Take your needle down, next to your first stitch. It is very important to angle your needle along the side of the split stitch and towards the previous stitch. This helps to keep a good angle and a smooth outside edge. 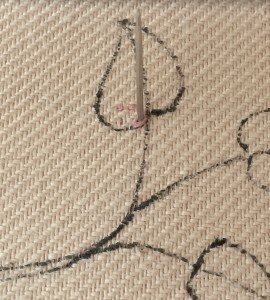 If you take your needle straight down, you will end up with a bitten effect along the edge and you will lose the angle. 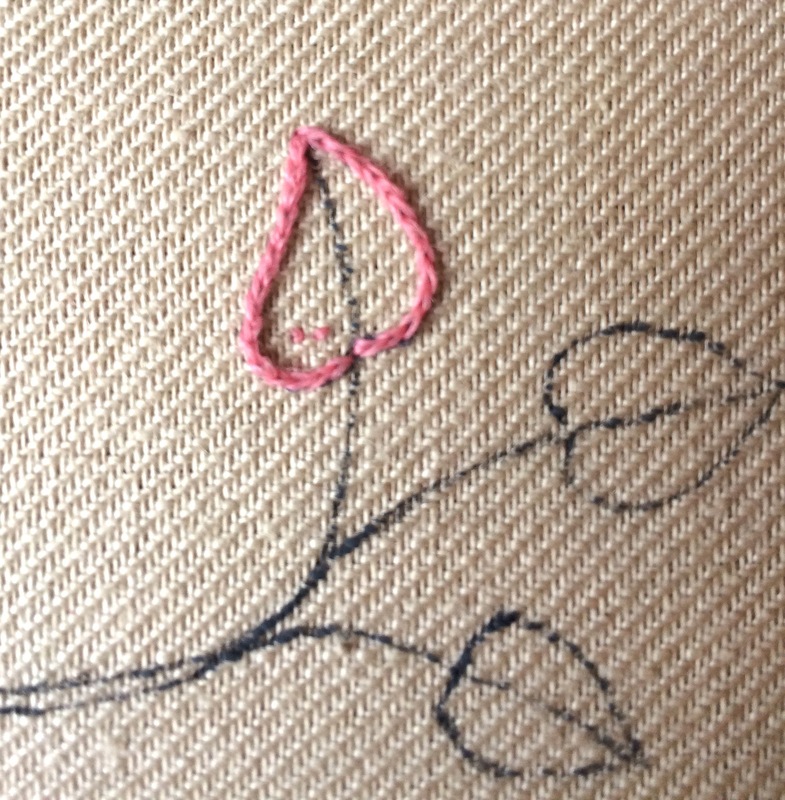 Continue working your stitches in the same way, bringing your needle up fractionally away from the previous stitch and tucking your needle in closely when you take it down. 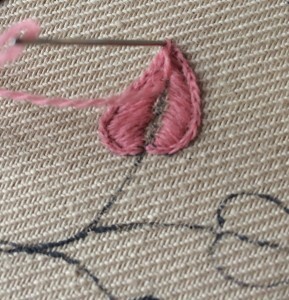 You will find that by doing this the angle of your stitches will naturally sweep round. 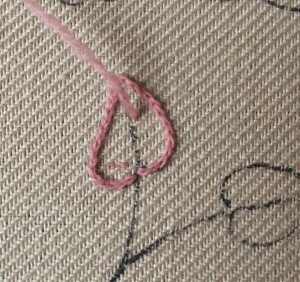 If you find this doesn’t happen, you may need to bring your needle up on the central vein, slightly closer to the previous stitch than you have been. When you have finished the first side, you can work the opposite side in the same way. 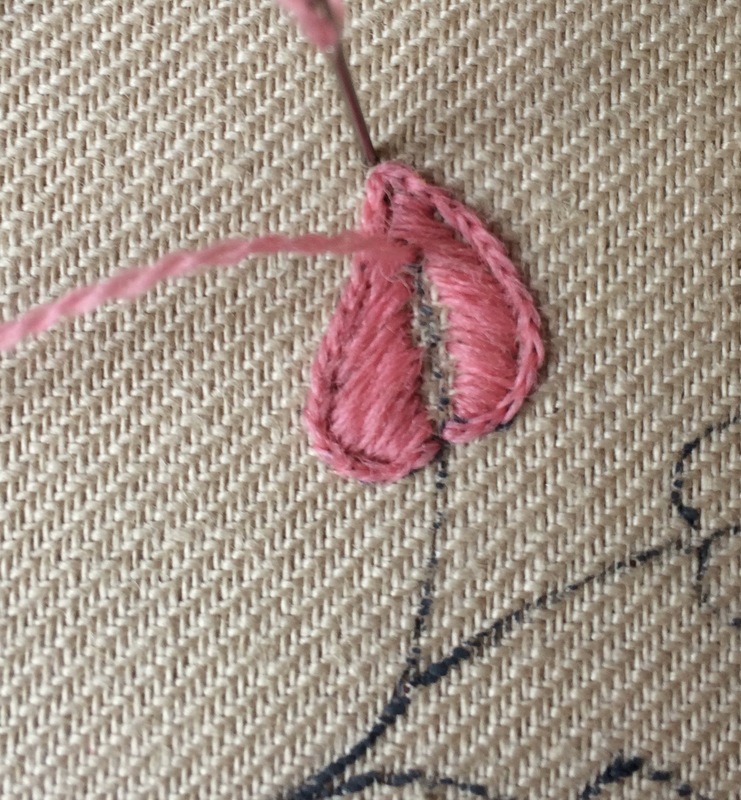 It is important when working your stitches, to make sure you leave a very small space down the centre to create the vein. 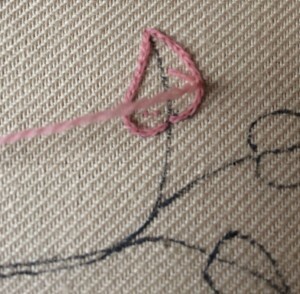 This can then be filled with a stem stitch to neaten everything up. I hope you have found this post useful? Feel free to comment with any questions.